Christine Diane "Chrissy" Teigen is a model of American origin. Chrissy is one of the anchors for Lip Sync Battle. She is a jury member for FABLife, a talk-show on lifestyle. Chrissy made her debut with the yearly Sports Illustrated Swimsuit, 2010 issue. Teigen is a cook and appeared on a Cooking Channel special, Chrissy Teigen's Hungry in 2013. She recently shot for Cookies and Cocktails, a cooking channel special. Teigen is a 'food stylist' on FABLife, a lifestyle talk show by Tyra Bank. Teigen enjoys writing. She authors the blog, sodelushious.com. 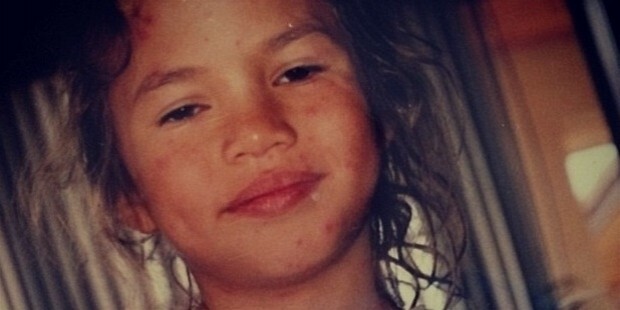 Chrissy Teigen was born on born November 30, 1985 Delta, Utah. Teigen's father is a Norwegian and mother is Thai. He worked as an electrician. The family settled in Huntington Beach, California. Teigen had her first exposure to the glamour world when she was spotted by a photographer at a 'surf' shop where she worked. Teigen is globally mirrored by IMG Models in New York. She came to be known as the 'IGN Babe' in 2004. Teigen hit big times when she was featured on the cover of Maxim's calendar. She has several prestigious campaigns to her credit; Skullcandy headphones, Olay, Nike, UGG Australia, XOXO, Nine West Fashion Targets Breast Cancer and Gap Factory. She was the fashion week correspondent and a model for the Beach Bunny Swimsuit. Teigen was a regular visiting anchor and a presenter on MTV, Extra with Mario Lopez, E!, FUSE/MSG and TMZ. She featured on Watch What Happens Live and America's Next Top Model. Teigen presented the “Model Employee” on VH1 in 2013. It was a reality competition show. Teigen's rise in the modelling industry was meteoric. She was declared "Rookie of the Year", on her appearance in the Sports Illustrated Swimsuit, 2010 issue. Teigen was spotted in the consecutive issues for the years 2011-14. She featured on their Golden Jubilee cover in 2014. Teigen featured on the covers of elite magazines; Cosmopolitan and Ocean Drive. She appeared in the editorials for Italian Glamour, Esquire, Vogue and Galore. She portrayed a charcter in Need For Speed: The Run, a video game by EA Sports in 2011. Teigen co-designed a swimwear 'capsule collection' with designer DiNeila Brazil. The line premeired at Mercedes-Benz Fashion Week Swim in Miami in 2011. Teigen is a cook and appeared on a Cooking Channel special, Chrissy Teigen's Hungry in 2013. She recently shot for a Cooking Channel special, Cookies and Cocktails. Teigen is the 'food stylist' on FABLife, a lifestyle talk show by Tyra Bank. Teigen enjoys writing. She authors the blog, sodelushious.com. Teigen was called Spike TV's "Our New Girlfriend" in 2012. She has made several appearances in televsion comedy series; Inside Amy Schumer and The Mindy Project. Teigen judged “Snack-Off”, a cooking show on MTV2. She featured in the song, "All Of Me", from her husband John Legend's music video. Chrissy was the co-anchor of Lip Sync Battle, a musical comedy programme aired on Spike TV in 2015. Teigen was the emcee at the Billboard Music Awards. 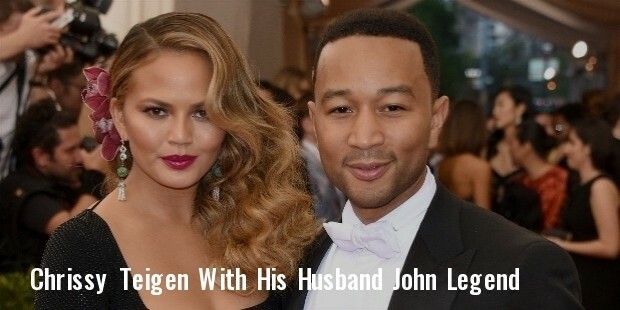 Chrissy Teigen is married to musician John Legend. They met in 2007 and dated for four years. The couple got engaged in 2011 and tied the knot in 2013. Chrissy is currently pregnant with their first child.